Now that we are approaching what Frank Sinatra attractively called the autumn of our years it might seem surprising that we fell for the Mazda MX-5 Roadster Coupe 2.0i Sport in such a big way. After all, these flashy little sports cars are for the young aren’t they? Not so! Look around as you drive and you will be amazed at how many older drivers are taking to the roads in these nifty two-seaters. And, come to think of it, why pay for a car to transport four or five people around when you only need to move yourself and a passenger? So, we feel a slogan coming on. Buy a sports car and save the planet! Luckily we are still fit enough to roll in and out of the low, leather seats and what a joy to open the top at the push of a button and feel the wind in our hair and the sun on our faces. We had an invitation from Niki McGrail Beadnall and her husband John to join them at Ardlamont House, their newly acquired Georgian country estate which sits at the bottom of the Cowal peninsular in Argyll, a particularly beautiful area of south west Scotland. The two lovebirds had just got married and were spending vast amounts of money and time in restoring and furnishing the main house and were still in the process of converting the lovely outbuildings and cottages into bijou residences for visiting tourists. In addition to all that they were keen to show us a remarkable ace up their sleeves in the form of a motor yacht called Llanthony built in the 1930s for a wealthy Welsh family and which took part in a number of daring rescues at Dunkirk in 1940 during the Second World War. So without further ado we packed the little trunk of the Mazda and set off. On our way north we dropped in on the Royal Botanic Gardens in Edinburgh. It was rhododendron time and the gardens were hosting a very important visit from the International Rhododendron Society, with delegates arriving from Europe, Canada and the United States as well as China where so many of the rhododendrons adorning these Scottish gardens originated from. In fact these amazing gardens only a stone’s throw from the city centre has the largest collection of wild-origin Chinese plants outside China. The seventy acres, containing thousands of trees and shrubs, also boasts a Victorian Palm House, the tallest of its kind in Britain, and a Scottish heath garden which recreates the plantings and landscapes of the Scottish Highlands. On a lovely evening we walked the gardens in the company of a number of delegates who told us of their pride and passion for growing rhododendrons in different parts of the world. We also met two adorable Chinese ladies who had travelled from their homeland specially to view the gardens and to see for themselves where many of their native plants ended up growing so successfully. The Scottish climate is perfect for rhododendrons and they have grown and prospered thanks to those intrepid plant hunters of the nineteenth century who travelled into the mountains of China, Nepal, Bhutan, India, Burma and Tibet to find the best and most colourful specimens to ship back to Britain. Those that found their way to the Victorian estates of Scotland passed through the Royal Botanic Gardens to be recorded and more often than not a sample was kept and planted. The result for us all to look at today is a spectacular display during May and June. All that walking had worked up an appetite so we headed off to our hotel for the night, a new concept in hotels that go under the name of Dakota. Named after the famous Dakota aeroplane they are the brainchild of Ken McCulloch who also happens to be the brains behind the Malmaison hotel group. Together with his designer wife Amanda Rosa he has opened two hotels in Scotland, one in Glasgow and the other in Edinburgh. The first one was opened in Nottingham. Situated next to motorways and busy roads the idea is to capture the traveling public who want a comfortable room and good dining for the night at a reasonable price. So for a flat rate of just under $200 a night you get a very good and surprisingly spacious suite with complimentary homemade cookies in every bedroom, Egyptian cotton sheets adorn the welcoming beds and 32” LCD televisions come as standard. Toiletries from Monaco provide an extra touch of extravagance. Each hotel boasts an excellent restaurant simply called The Grill. They pride themselves on finding good locally sourced ingredients so we ordered a huge roast shellfish platter which came with lobster, langoustines, crab, mussels, clams and scallops. It was superb and just what we wanted with a bottle of Sancerre to wash it all down. We were not sure what to expect from this hotel but from the moment we stepped inside it oozed a calmness all of its own. The lobbies are painted in chocolate and cream with squashy sofas to flop into and take the weight off your feet. The staff seem switched on and helpful. We met the manager who gave us a run down on the place and was full of praise for his boss Ken Mculloch. The next morning the sun shone from a cloudless blue sky. We drove west along the M8 leaving Edinburgh behind, skirting Glasgow and Clydebank where we caught our first glimpse of the River Clyde spilling into the estuary. A few more miles on the A8 took us past Port Glasgow and then Greenock until we had in our sights the ferry of Western Ferries which sails from Gourock to Hunter’s Quay in Dunoon. It takes only twenty minute so you can just sit there in the car if you feel so inclined or get out and have a cup of tea and go on to the top deck to take in the spectacular views. The narrow piece of water that the ferry crosses is part of the Firth of Clyde. As we crossed and looked back from the top deck towards Greenock we realised that this was where some of the most famous ships in the world were built. The banks of the Clyde from Glasgow all the way down to Greenock were once lined with shipyards. They employed tens of thousands of men to build famous ocean liners like the Queen Mary, with her three red and black Cunard funnels. She was launched in 1934, a giant at 1,000 feet long and weighing 80,000 tonnes with a top speed of over thirty knots. Time and again she won the Blue Riband for the fastest Atlantic crossing and held it until 1952. Used as a troop ship during the Second World War she managed to hang on for another twenty years after that, boldly plying the Atlantic and carrying more than 2,000 loyal passengers on each crossing until she lost out to the jet aircraft that could do it in a few hours rather than several days. Luckily this iconic liner escaped the scrap yard and you can still see the great ship on Long Beach in California where she puts on a brave face as a museum and hotel. Before that particular Queen the equally famous Lusitania was launched on the Clyde in 1906. At that time she was the largest ship afloat at 800 feet long weighing 31,500 gross tonnes, the last word in speed and luxury taking passengers in grand style across the Atlantic. Tragedy struck, however, when she was on her way back from New York during World War 1. Close to the end of her journey and with the Irish coastline in sight she was attacked by a German U-Boat. Hit by a torpedo it took only eighteen minutes for the great liner to sink with a loss of 1,195 lives which included 123 Americans. Not long afterwards the United States entered the war. Looking at it now it is difficult to believe that this was where the finest shipyards in the world once turned out not only ships of steel but beauties like the Cutty Sark, a nineteenth century clipper which became one of the fastest sail-ships on the long route between Britain and Australia. “Clydebuilt,” they called it, which was synonymous with quality, workmanship and reliability. “Mazdabuilt” could apply to our car. 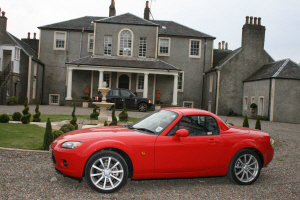 Its stiff chassis, precise steering and double wishbone suspension delivered incredible handling; twisting and turning on the narrow roads the car’s impressive power-to weight ratio kicked in as we headed towards Ardlamont. Flicking through the six speed gearbox the car was a delight to drive and with the top rolled back, which takes a mere twelve seconds and does not intrude on the boot or trunk space, it really was exhilarating and before we knew it we were drawing into the driveway of our hosts at Ardlamont. Ardlamont House, only eighty miles from Glasgow, goes back to 1646 when it was the seat of the Lamonts, who were thought to have fought with Robert the Bruce against the English at the Battle of Bannockburn in 1314 but in 2005 it came on to the market, so enter Niki and John. Niki found it quite by chance when she was visiting the area. It’s a classic Georgian house with outbuildings and cottages and a walled kitchen garden, oh and a ha-ha with long views from their south facing windows over pastures full of their own horses and on to the sea. In the distance are the Isle of Arran, Bute and the Mull of Kintyre. What more could you ask for. Now, a couple of years down the line, they’re both hard at work restoring it for a range of visitors. So they are offering self catering in their cottages, a bunkhouse for walkers and cyclists, a marvellous venue for weddings, some good pheasant and partridge shooting and an equestrian centre that offers carriage driving. Niki and John took us out for a short drive in one of their carriages. It is a marvellous way to see the countryside with the clip clop of hooves along the little road and then through the gardens past beautiful rhododendrons and azaleas in full bloom. Another time we would have packed a picnic and headed off for a full day. Niki and John have another ace up their sleeves and it comes in the form of a Dunkirk little ship called Llanthony. 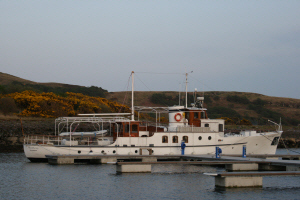 This 1930s gentleman’s motor yacht, all 70 tons and 77 feet of her was originally built for the Beaumont Thomas’s a well-to-do Welsh family who named her after the town they lived in. But in 1940, during World War ll, she set off for Dunkirk under the command of Rear Admiral Robert Timbrall of the Royal Canadian Navy. He’d retired so he was serving as a sub lieutenant at Portsmouth. His mission was simple; collect, along with a flotilla of hundreds of other naval and civilian crafts, as many stranded and trapped troops on the beaches of Dunkirk as he could manage. With his crew of two engineers from London Transport and six sailors, who were apparently lumberjacks from Newfoundland, they set off. The little ship went through hell to rescue her quota of troops. The Germans shelled her remorselessly but she kept going, ferrying troops to the larger navy ships waiting further out to sea until she took a direct hit which killed several of the crew and crippled the fuel supply to her engines. Luckily she was able to get going again and she sailed back to England for the last time. In all Llanthony rescued 280 troops form Dunkirk and has gone down in history in what Sir Winston Churchill called “a miracle of deliverance.” No wonder. Dunkirk had been reduced to rubble by the Luftwaffe and yet nearly 350,000 allied troops were rescued to fight another day. After the war Llanthony fell into the welcoming arms of Lord Astor who used her to cruise in the Mediterranean with his family and friends and after that she spent nearly ten years sailing the waters of Greece and Turkey as a charter vessel and then, sadly, the brave little yacht was mysteriously abandoned in Rhodes harbour. And that might have been the end of her if it hadn’t been for the determination of Niki to bring Llanthony back from the dead. Niki is something of a Florence Nightingale in the yachting world but she knew that anything made by the British firm of Camper & Nicholsons, famous for building schooners and cutters, luxury yachts for tycoons and in wartime minesweepers and patrol boats must be worth saving. So she bought the yacht and sailed her to Marmaris in Turkey on a flat calm day limping into the harbour on one of her two engines. It was here that Niki had the yacht restored over the next twelve months and then as recently as 2004 the yacht was completely re-plated and her old Mercedes Benz engines replaced with two brand new ones Caterpillar 350s actually, allowing her to cruise at a very comfortable ten knots. The gorgeous and original oak panelling and brass fittings were done up as well until half a million pounds later Llanthony shines like a new pin again and is all set to go cruising. Our journey home was something of a cruise as well. Off came the top of the MX5 again and we buzzed along the narrow roads to the ferry in brilliant sunshine. We had fallen for this little beauty in a big way. We are now well and truly hooked on the pleasures of open top sports car life! Western Ferries for the short crossing between Gourock and Dunoon cost $65 for the car and two passengers. Four sailings an hour at peak times. 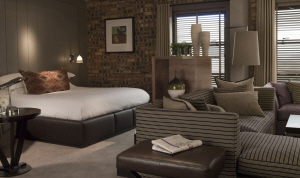 Dakota Forth Bridge Hotel is on the outskirts of Edinburgh at South Queensferry. Double room about $195. Dinner, seafood platter for two $75. Ardlamont Estate offers self-catering in cottages and flats and bed and breakfast is available in Ardlamont House for family parties. 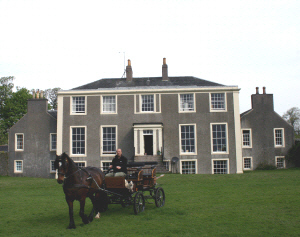 The estate also caters for weddings, film shoots and other events. Shooting parties of up to ten guns can also be accommodated. MY Llanthony is available for charter. On the Cowal Peninsula not far from Ardlamont is the most northerly lavender producer in the UK. Millcroft Lavender is in a delightful setting, has a small tearoom and a unique museum of local artefacts as well as a small shop selling a range of lavender related crafts. Portrait of Britain, published by Dorling Kindersley. Husband and wife, Keith Allan and Lynne Gray are travel writers and photographers based in Berwick upon Tweed on the English/Scottish border. They have worked for The Times, Daily Telegraph, Financial Times, House and Garden, Scotland on Sunday and The Herald. For more than twenty years they have worked as freelance producers and reporters for BBC Radio, working from their own independent studio for BBC Radio 4, Radio 5 and Radio Scotland as well as the BBC’s World Service.